Freedom of conscience underpins many of the other human rights that we all enjoy. This is why the right to express your belief is enshrined in the 1948 Universal Declaration of Human Rights. However, this freedom is being marginalised. The Global Charter of Conscience will bring religious tolerance back to the centre of public debate, and it will help future generations engage freely in the public life of their nation. The Charter has been drafted by people of many faiths and none, politicians of many persuasions, academics and NGOs, all committed to a partnership on behalf of “freedom of thought, conscience and religion” for people of all faiths and none. The Charter calls for the cultivation of civility and the construction of a civil public square that maximises freedom for everyone. It provides a vision and framework to help us discuss and resolve our present problems in a constructive, rights-honouring manner. "The Global Charter of Conscience is a powerful document. I appreciate its enormous potential to inspire practical commitment on behalf of freedom of thought, conscience, and religion or belief and to contribute to a better understanding of human rights in general. In the spirit of the 1948 Universal Declaration of Human Rights (UDHR), the Charter underlines the universal validity of freedom of religion or belief as an inextricable part of a holistic human rights agenda in which civil, political, economic, social and cultural rights can mutually reinforce each other." This is a unique and timely document that elaborates on the fundamentals of religious freedom as they have been enshrined in Article 18 of the Universal Declaration of Human Rights of 1948. That pivotal article was written by my late father, Charles Malik, and adopted as is by the Human Rights Commission back in 1947. In it, the right to change one’s religion is clearly spelled out, as is the right to worship both in private and in public. 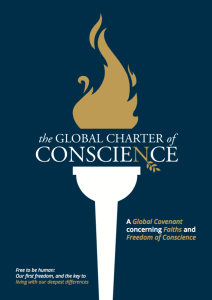 The Global Charter of Conscience...will hopefully serve as an international rallying point for all people concerned about protecting freedom of religious belief and conscience. The Charter calls for a new and deeper vision of freedom of thought, conscience and religion. These freedoms must be respected everywhere despite global challenges such as growing diversity and coexistence of different world views.